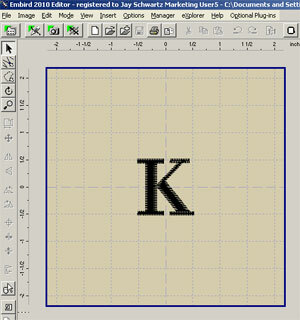 Embroidery Library has more than 100 alphabets for your monogramming projects. Some alphabets consist of capital letters only; some include lower case, numbers, and punctuation. You can browse through the wide variety by visiting the Alphabets category here. Alphabets are packs of letters and numbers. They're not "fonts" or .ttf files, or files that you can install in a lettering program. Alphabets and fonts both have benefits and detractions. Alphabets give a better quality results than fonts, but the letters are placed and stitched one at a time. 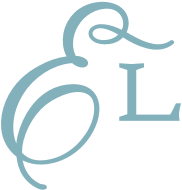 You can merge letters together to form words and monograms, as shown below. Conversely, fonts are faster to use. But because they're created "on-the-fly" with embroidery programs, they have insufficient lock-ins and cover the fabric poorly. For the best quality, choose alphabets. The letters we're using in this example are from the Bodoni Alphabet. 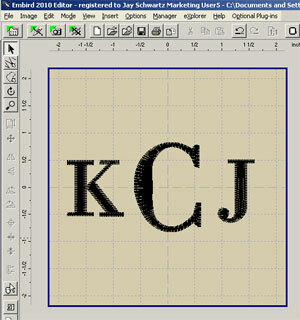 To make a three-letter monogram, I placed the three letters (KJC) in a folder on my computer. I opened Embird and used it to open the K. Then, I went into Editor mode. 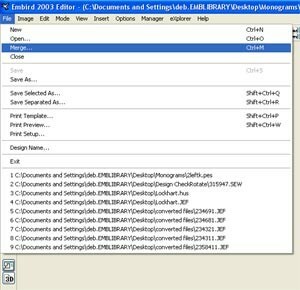 I chose "file," then "merge," and selected the letter C. Then, I repeated the steps, and selected the J. Now all three files showed in my work area. I could click on them, move them around, and line them up. Once they were spaced properly, I saved the design as a new file, and uploaded it to my embroidery machine.